LONDON: 18 JANUARY 2005 - Mercator Gold plc (AIM: MCR) as operator of the Annean Joint Venture announces that drilling has intersected high-grade gold mineralisation at Surprise, the second of three targets being drilled in the Yaloginda region near Meekatharra, Western Australia. Other intercepts of note include Hole 04SURC014 which intersected 6m @ 36 g/t Au from 155m down-hole and Hole 04SURCDD013 which intersected 5m @ 6.3 g/t from 132m down-hole. In addition to the high-grade gold, wide zones of low-grade mineralisation have been recognised in the host porphyry intrusive at Surprise. Mineralisation at Surprise is open at depth and will be tested in future drilling. Gold at Surprise is associated with a conjugate set of veins, one flat and the other steep north-dipping. While the host rocks differ in detail, the structural geology is similar to that of Mt Charlotte at Kalgoorlie. Mercator management has an exploration target of 2,000,000 ounces of gold contained within four resources each of at least 500,000 ounces within the Annean Joint Venture area. The highgrade Bluebird drilling results announced in December and today’s Surprise results means the company is on the way to identifying the first two of these resources. 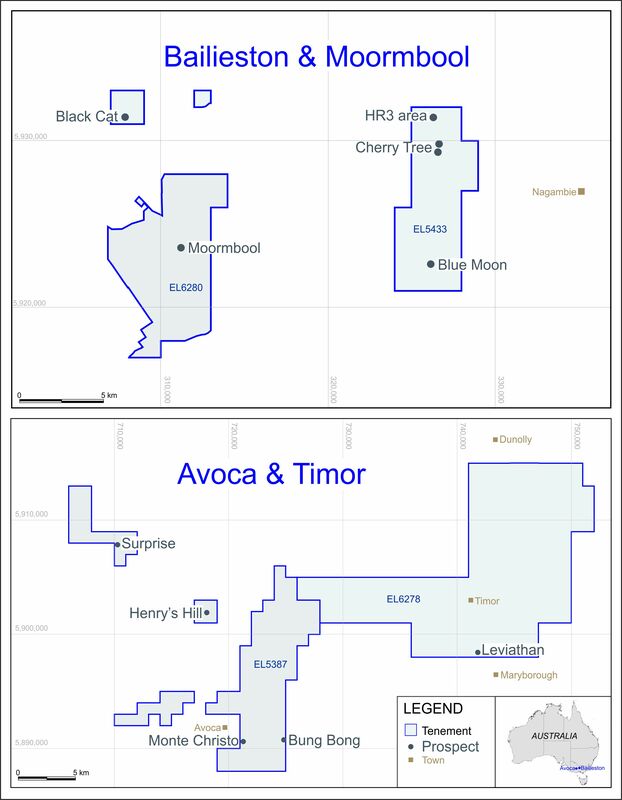 Management is highly encouraged by the results and, having expended the first AUD$1 million (£406,500) on exploration, has decided to proceed to Stage 2 of the Joint Venture by spending the next AUD$2 million (£813,000) on exploration before March 2006 to secure a 45% interest in the Meekatharra properties. Surprise is the second of three resource extension targets in the Yaloginda mine area, immediately south of Meekatharra, Western Australia, being drilled by Mercator. The company considers that each has the potential to contain in excess of 500,000 ounces of high-grade gold. The targets are within 4km of the St Barbara Mines Ltd (“SBM”) Bluebird mill that is currently on care and maintenance. The drill results are presented in the Table 1 below. The drilling, all from surface, shows almost complete gold anomalism within the porphyry host at Surprise, illustrated by the 35m of intercepts in Hole 04SURCDD015. Intercepts of high-grade gold include Hole 04SURCDD012 adjacent to the Surprise open pit which returned 15m grading 45.1 g/t Au from 127m down-hole, Hole 04SURC014 which intersected 6m @ 36 g/t Au from 155m down-hole and Hole 04SURCDD013 which intersected 5m @ 6.3 g/t from 132m down-hole. In addition to the wide high-grade zones, low-grade gold is recognised with the host porphyry intrusive at Surprise. Hole 04SURCDD013 results are incomplete as drilling ceased over the Christmas break with the hole still in mineralisation. The Company’s current 20,000m drilling programme under the Annean Joint Venture is on-going, including the completion of hole 04SURCDD013 at Surprise.